The challenge is to create a CAS card using the paper piecing technique. I used Basic Grey Pink Rhinestone stickers (from Clear Dollar Stamps) on the flower but in this photo you cannot see them very well. My layout inspiration comes from Paper Crafts Magazine Dec 06/Jan 07 pg 16. I don't have a collection, I go to the library and check them out. They are fabulous for ideas. I love this layout and sure I will be playing with it. I used it today because I thought it would showcase my paper pieced image well. I stamped my image multiple times and cut out different parts of it each time and layered it for a more dimensional look, but I did not used dimensionals. I like that the paper piercing I did on the three sides draw attention to the sentiment and even the image because of the way it is facing. Cool, even though my piercing is a little crooked, what can I say it is hand done. Lisa, this is soooooooooo cool! Love how you pierced around the flower (will have to remember & CASE that...lol!). And I have to say that I just saw your Rosebud Princess card in the CDS gallery, and all I can say is WOW, WOW, WOW!!! What a CLEVER idea, creating a ribbon rope for her prince to climb...and I love that pink dp. What a prize our dt has in you! Oh, this is so awesome. I love how you paper pieced this flower. Gorgeous! Great layout too! Simply AMAZING piercing going on on this one! 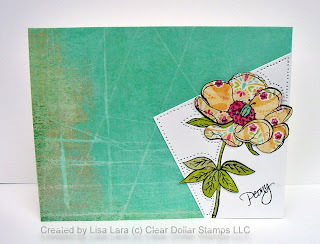 Also, what a fab idea to paper piece that Peony! Such a lovely card!